There are eighteen main Mahayana Buddhist Mahaviharas( Great Mahayana Buddhist Monasteries) in Kathmandu Metropolitan City. Among them ITUMBA (Itumbahal) is one of the oldest and most important and famous Mahavihara built at the center of Kantipur city i.e. Kathmandu in the middle of 11th Century AD. Its real and full name in Sanskrit language is Shree BhaskardevaSamskaritaSata Shree KeshavachandraKritParavatMahaviharai.e ITUMBA or Itumbahal in short form and welknown as in local language. Shakyamuni Gautam Buddha had once preached to King Bimbisara that amongst the donations the donation of a BauddhaVihara is the best one where the Buddhist monks dwell in, learn and practice the teachings of the Buddhism and finally propagate Buddhism to the laity,the local residents. The teaching of the Buddha encouraged many kings and generous persons and were very much excited to start building Buddhist viharas for the Buddhist BhikshuSangha. King Bimbisara for the first time built VelubanVihara in then Sravasti City and donated to Shakyamuni Buddha. The Shakyas of then Kapilvastu Republic also built NigrodharamVihara for Shakyamuni Buddha to rest in when He returned to Kapilvastu after attaining the Enlightenment at Buddhagaya in 588 BC i.e. in the year 103 AnjanSamvat or MahaSamvat or ShakyaSamvat. Anathapindaka, the famous merchant and sincere devotee of Shakyamuni Buddha, bought land from Prince Jeta and built Jetavana Vihara and donated to the Buddhist Sangha as well. And so, after that many many Buddhist viharas (Monasteries) were built by rich and generous persons for getting good merit in this very rear human life. Shakya Prince Siddhartha after viewing the four heart touching scenes of an old man, a sick man, a dead body and a calm and peaceful saint renounced the luxurious worldly life of the Royal Palace and spent an ascetic simple life roaming here and there in search of the supreme knowledge and eternal peace. After the hard practice of six years meditation at last, He was successful in attaining the supreme knowledge and had become the Buddha 2600 years ago under the holy Bodhi tree at Buddha Gaya in the year 103 AnjanSamvat or MahaSamvat or ShakyaSamvat that is to say in 588 BC. He, first of all, carefully reexamined the knowledge he has attained for seven weeks by himself once again. Then after conforming that he has really attained the enlightenment without any doubt he gave his first Sermon to the five sages known as PANCHA VAGGIA on the full moon day of the month of ASHADA (July-August) at Mrigadavana; the Deer Park at Saranath in the year 103 AnjanSamvat or MahaSamvat or ShakyaSamvat that is to say in 588 BC i.e. 2600 years ago. All of the five sages became Bhikkus i.e. Buddhist Monks and thus laid the foundation of BhikkhuSangha and formed the first Buddhist Sangha by Shakyamuni, the Buddha himself 2600 years ago. The numbers of the Buddhists Sangha increased day by day. Most of the Shakya princes and other followers became Bhikkhus under the spiritual guidance of Shakyamuni Buddha. Those who had renounced the world and became Bhikkhu could not live in the general house. So separate dwelling places were built as the learning and living places for the Bhikkhus i.e. Buddhist monks. The dwelling places built for the Buddhist monks were known as Ashram or Viharai.e.Buddhist monasteries. So the Buddhist Viharas are as old as the Buddhism itself. Therefore the history of Buddhist Viharas can be traced back to the 6th century B.C. Since then many Viharas were built at different places for the Buddhist monks by different persons of good wealth. One day King Bimbisara also donated Venubana for the Buddhist Sangha as Buddha had preached that amongst the donations the donation of Vihara is the best one where the Buddhist monks dwell in for the propagation of Buddhism. 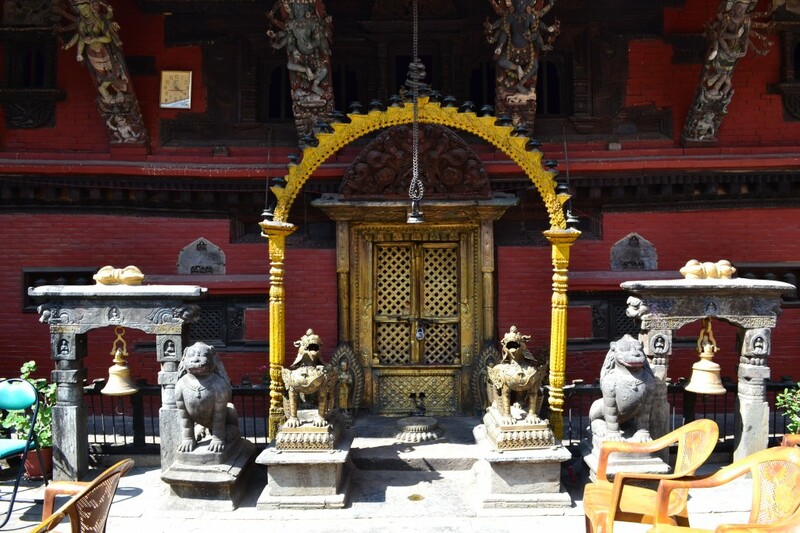 In Kathmandu, viharas were built during the period of Licchavi kings. The history book of ancient Nepal indicates at least twenty names of Buddhist Viharas of the Licchavi period in Katmandu valley. There were eighteen main Buddhist Mahaviharas in the Kathmandu valley. Among them Bhaskar deva Samskarita Shree Keshachandra Krit Paravata Mahavihara (Itumbaha) is one of the oldest and most important Vihara in Katmandu valley. It is believed that this Mahavihara is built after the visit of Shakyamuni Gautam Buddha in Kathmandu Valley for the Darshan of the Swayambhoo Jyotirupa Mahachaitya. It is built for those Buddhist monks who ordained into Buddhist order of the Sangha by hearing the preaching of the Buddha. That is why Itumbahal is one of the very ancient Mahayana Viharas of Kathmandu valley. The Dharmadutas of the Emperor Ashoka had visited this Vihara and had ordered to built an Ashokan Caitya here at Itumbahal which is still existing in proper condition at the center of the Vihara courtyard. However it very difficult to mention the accurate day and date on which the vihara was Constructed and consecrated. The most authentic historical evidences are yet to be found out regarding the accurate day and date of construction of this Vihara. Almost all of the historians, however believe that this Vihara is one of the oldest Viharas in the Kathmandu valley. In Kathmandu valley most of the Buddhist Viharas were built during the period of Lichchhavi kings. If we analyze the Sanskrit names of the Vihara, we find the words as ” BhaskardevaSamskarita “. This means that the Vihara was brought into existence by the King Bhaskardeva that is to say the Vihara was built by Bhaskardeva. If we go through the Vamsavali; the chronicles of Nepal, we will find three such names :- 1). BhaskardevaVarma, 2). Bhaskardeva, the Thakuri king from Nuwakot and 3).BhaskarMalla Deva. The first one is of the 7th century, the second one is of the 10th century and the third one is of the 17th century respectively. King BhaskardevaVarma ruled 13 years where as Bhaskardeva, the Thakuri king from Nuwakot ruled in Kathmandu only for 3 years. Where as the third BhaskarMalla Deva ruled Kathmandu for 8 years. During the reign of BhaskardevaVarma the golden city of Kantipur was built with a large quantity of gold amassed from different parts of the countries in the South during the course of his invasion in the countries of the south. The Gopal Vamsavali the only old historical book mentioned that He offered many gold to make the roof of Pashupatinath temple golden-roof. Where as the second Bhaskaradeva, the Thakuri king from Nuwakot, though ruled for three years only in Katmandu, the historical records shows that he was very actively ruling Nuwakot area for fifteen years. When there were no kings in Katmandu to rule because of massacre of 12 rulers ; for 8 years King Bhaskaradeva was made king of Katmandu as well. This King as a Buddhist had built Buddhist viharas in Lalitpur city as well as in Katmandu during his three years very short period. The two viharas in Lalitpur were completed where as the vihara built in Katmandu could not be complited during his short period of reign, and it was unluckly the yatumbahal ,which is nowadays known as Itumbaha in local language. The third BhaskaraMalla deva of the 17thcentury AD also seems to had renovated the vihara and visited the vihara during the consecration ceremony. This Bhaskardeva Samskarita Keshachandra Krita Paravat Mahavihara locally known as ITUMBAHAL has very close relation with the Buddhist ritual ceremonies of Bungadhyo i.e. the Red Matchhendranath of Bungamati village, which was brought into Nepal from Kamarukachhe of Assam in India by king Narendradeva of Bhaktapur , priest Vandudatta from Kathmandu Tebahal and Rathanchakra, the farmer from Lalitpur . As Matchhendranath is instituted in a temple at Lalitpur every year holy water from Itumbahal is to be carried to the temple of Red Matchhendranath in Lalitpur for the festival bathing of Bungadhyo (Red Matchhendranath) on the day of Baisakhkrishnaprtipada. This Buddhist ritual is still in continuously in practice. It is said that there was very big white Sandle tree at Itumbahal many centuries ago. It is believed that a white Tara named MahashantaSweta Dharma Chakra Tara who had come from Tibet, used to preach Dharma under the sandaltree. The tree was so big that the root was spread into the Kastamandap. A Vihara was built at the side of the root of the tree and so it was named as Tarumula Mahavihara or SikanmooBaha (SrikhandamulBaha) in local Newari Language. There is a Guthi (Trust) known as SalanpaGuthi in Itumbahal. The trust members have to make arrangement for the exhibition of the builder of Itumbanal, Keahachandra along with other Buddhist statues of the Vihara for two weeks every year in the month of Shrawan. This guthi should be solemnized by inviting Vajracharya priests from different Buddhist Viharas of central Kathmandu and request them to read the text of A holy book AstasahashrikaPrajnaparamita written in gold for one week. About 2oo Vajracharya priests were invited from four different Viharas visit Itumbahal for reciting the holy book and they all have to be feasted after they finish reading the text for that day. Every year in the month Gunla i.e. from ShrawanShuklapratipada to Bhadra Krishna amawashya the Sangha member of the Vihara go to the Swayambhoo hillside early in the morning along with a band of GunlaBajan. The band along with the devotees go round the SwayambhooMahachaitya reciting the Buddhist hymns. At the end of one month, the completion feast is organized by GunlaBajanKhala. In the month of Ashad the senior members of the Sangha that is Sthaviras has to observe a special fasting ceremony known as ” KayetamaduDhalan “. It is observed every year specially for the purpose of making rain fall for the rice plantation . It is specially observed for Naga Sadhana pleasing them to make rain. That is why no women were allowed to interrupt or take part in the fasting. Nitya Puja i.e. BAPA, the daily worship is done four times a day in the main shrine. The first one is early in the morning; the second one is at about 9 O’clock in the morning, the third one is at the daytime about two o’clock and the fourth one is done in the evening. The member of the Sangha who has ordained get one week’s responsibility for Nitya Puja turn by turn starting from Sunday early morning. The sangha member can notdenay from taking this one week’s responsibility for Nitya Puja turn by turn according to the seniority of the sangha which starts from Sunday morning. Though Itumbaha is one of the oldest Buddhist Monastery rich in culture, tradition and Buddhist monuments in the Katmandu Valley, it faced unnumberable thefts and unauthorizelydesposing and illegal capturing forcefully land property donated so piously by Keshachandra, the builder of Itumbaha; for the timely maintenance of it. There were 11 sthaviras;the senior elders in the Itumbasangha,who are incharge of all necessary worshipping and performing the necessary rituals of Itumbaha for the whole year and were also incharge of the trust land and property of the vihara, donated so piously by Keshachandra. Once upon a time Itumbaha was very famous vihara with Gold roof and pinnacles as well as full of exotic art and crafts all around it. The condition of the vihara was so deteriorating in the twentieth century that he tile roofs are fallen, the wooden sturts are fallen and broken and the brick walls were broken cracked that if any steps for its restoration is not taken we were in the state of loosing our national glorious Buddhist Heritage. Luckly, In such a nick of time, the timely and kind attention of Mr. NeilsGutchow, the German expert on Nepalese Baha, Bahi and Caitya of Katmandu; be drawn for its timely restoration under his Buddhist Katmandu project under the technical supervision of Kathmandu Valley Preservation Trust and with the generous and pious financial support of the German Embassy in Kathmandu and the people of the Federal Republic of Germany. As a result a legal permission was sought and officially granted by HMG department of Archaeology and so a legal deed of aggrement was duly signed in between the Katmandu Valley Preservation Trust and ShriBhaskaradevaSanskaritaKeshchandrakritaParawataMahavihara Conservation Adhoc Committee represented by Chairman, Capt. Chandra Bahadur Shakya on behalf of the Itumbasangha. Federal Republic of Germany has demonstrated its close relationship with the Kingdom of Nepal through its support for the renovation and conservation of ShriBhaskaradevaSanskaritaKeshchandrakritaParawataMahavihara. During the first project phase, the SwayamaduAagamChhen, the residence of the secret deity in the south wing was renovated. In the second phase, the KwapadyoChhen, holy shrine of AchhyobhayaTathagata in the West wing was restored. Work was carried out under the supervision of the Kathmandu Valley Preservation Trust as part of the “Buddhist Kathmandu Initiative 2002 ‑ 2005 AD”. The Department of Archaeology of His Majesty’s Government of Nepal and the Kathmandu Metropolitan City provided fruitful support and cooperation. It is completed on this full moon day of Dillatho of Nepal Era 1125 corresponding to 21st July 2005 AD, 6th Srawan 2062 BikramSambat, Buddha Era 2549, Anjan (Shakya) Era 2696, during the reign of our illustrious King Gyanendra Bir Bikram Shah Dev. The Itumbasangha members are very much obliged to the ambassador and people of the Federal Republic of Germany, the dedicated persons of Katmandu Valley Preservation Trust, the Department of Archaeology, the heritage department of Katmandu Metropolitan City and many such generous people from the society who directly and indirectly provided good support for the restoration of this historically and culturally so important Buddhist Monastery, a lively monument of Shree Keshavachandra, the builder and donar of Itumba in the first half of the eleventh century AD. In fine, the task of maintaining and the preserving the historically and culturally so important Buddhist Monument built and donated by Keshavachandra, has come in the hands of the senior Sthabiras of Itumbasangha, members of Itumba Conservation Committee;known as BhaskardevaSamskaritaKeshachandraKritaParavatMahavihara Conservation society, and all sangha members of Itumba. They all should join hands in preserving it by obtaining and maintaining legal documents of vihara, trust lands and other property belonging to Itumba finding without any delay wherever these properties lies. I am sure and certain to say that the doors of prosperity of Itumba has once again opened for all as a best example of culture and heritage of the kingdom of Nepal. It is really a visit worthy Buddhist monumental historic place in the heart of Katmandu, the capital of the Himalayan Kingdom of Nepal. So please do visit Itumba and have a look around it and give us a chance to welcome you for the fulfillment of the dreams of Keshavachandra, the builder and the donor ofItumba. Thanks to all once again and may all be very well and happy. This entry was posted in Itumbahal on December 29, 2013 by Prof. Swasti Ratna Shakya.